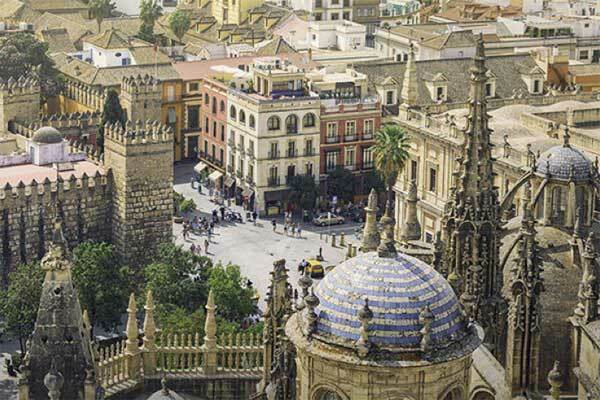 For many, Seville (in Spanish, Sevilla) is the romantic, passionate heart of Andalucía, the large Autonomous Community that covers much of southern Spain. 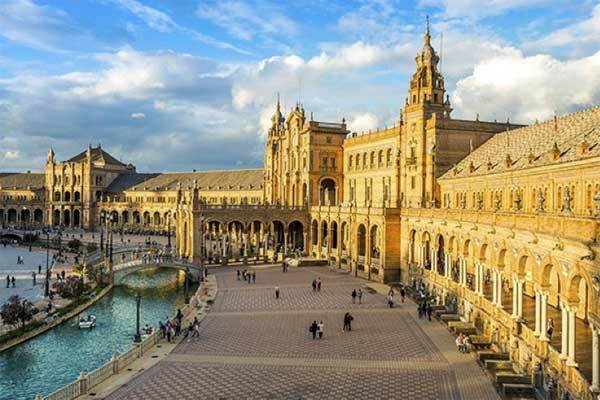 A city of nearly infinite charm, Seville (population about 700,000 in the city and 1.5 million in the greater metro area) is a mecca for those who love gracious living, southern Spanish style. Located on the Guadalquivir River, the largest navigable river in Spain, Seville is about 50 miles from the Atlantic Ocean. (It’s the only major commercial river port in Spain, and it has been since antiquity.) 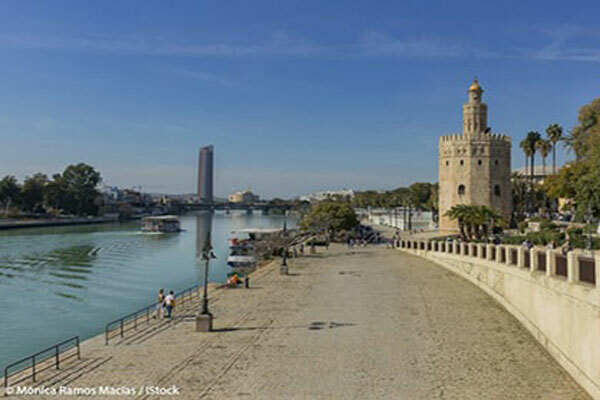 Seville is the capital of the Autonomous Community of Andalucía and a major economic center for the region; it’s important in technology, aerospace, renewable energy, and research and development related to these industries. Certainly, Seville’s ambience evokes this past. When you stroll through the Patio de los Naranjos—the Patio of the Orange Trees—next to Seville’s massive Gothic cathedral…or climb the Giralda Tower—whose ramped floor to the top could accommodate riders on horseback—you can feel as though you’ve stepped back into Spain’s Moorish past. But, in fact, few of Seville’s buildings are genuinely Moorish…. Rather, the locals liked the architectural style so much that they continued to imitate it for centuries after the Moors left. And, indeed, the style fits the city and its climate. Winters are relatively mild, with average highs in the 60s F and lows in the 40s F. But summer temperatures, especially in July and August, can soar well over 100 F, with next to no humidity. How better, then, to spend the hot days than in a house with thick stone walls to keep out the heat and a placid central patio, perhaps with a tinkling fountain in the center, and masses of flowers around it? This lifestyle has appealed to Sevillanos for centuries…and in this city, tradition runs strong. Once you’ve visited Seville, you may find yourself wanting to return permanently. And that’s definitely possible to do. This is a city that rewards exploration by those who have the time to do so leisurely, wandering its streets, sitting in its cafes, and imbibing its atmosphere. Though you may want a car to wander the Andalusian countryside, it’s easy to explore central Seville on foot and on public transport—no car needed. Seville has city transport by bus, tram, and metro. A commuter rail service (cercanías) connects the central city with the greater metropolitan area. And getting to Seville from elsewhere is easy. Long-distance trains leaving from the main Santa Justa train station connect the city with the rest of Spain. (Seville is as little as two-and-a-half hours from Madrid on Spain’s high-speed AVE trains.) You can also fly into Seville’s San Pablo airport, the second-busiest in Andalucía. It’s used by discount airlines that include RyanAir, Vuehling, and easyJet, as well as by major carriers British Airways (flights to/from London Gatwick), Lufthansa (Frankfurt and Munich), and TAP Air (Lisbon). As a result, getting around Europe from Seville is a snap. For healthcare, Seville has a number of excellent hospitals, both public and private. The two main public hospitals, the Virgen del Rocío and the Virgen Macarena, are both university-affiliated. And the private Hospital Quirónsalud Sagrado Corazón in Seville often is listed among the best hospitals in the country. To retire in Spain, you’ll need to get a long-term residence visa. You’ll need to apply for it from your home country, then go to Spain to activate it. For citizens of non-European Union countries (including the U.S. and Canada), the main requirements include showing proof that you are economically self-sufficient and that you have private health insurance valid in Spain. Seville has a lively restaurant and bar scene, especially in popular neighborhoods like Santa Cruz, the old Jewish quarter in the city center, and Triana, the former gypsy quarter that is across the Guadalquivir from the main city. Tapas in Seville have practically been raised to an art form, and tapas bar-hopping is practically a sport. Because Seville gets as many as 300 days of sunshine a year, and winters are mild, expect to be outside a lot. Outdoor cafés, called terrazas, abound, as do popular festivals that take place outdoors. Because Santa Cruz and Triana ooze character and color, they’re extremely popular with tourists. 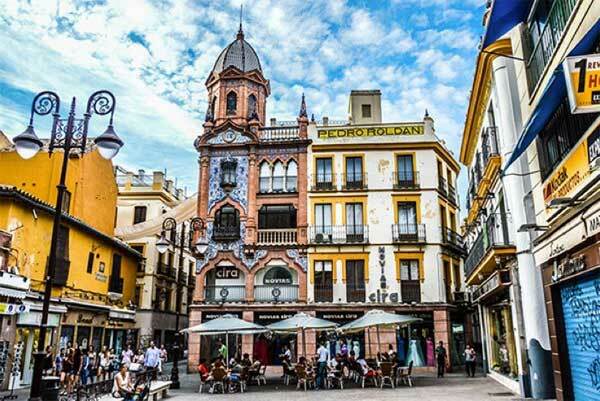 So for full-time living, better bets may be neighborhoods like El Arenal—the upscale neighborhood near Seville’s famous bullring—and the neighborhoods near the Parque María Luisa and the Plaza de España, among others. Keep in mind that electricity costs in Spain are relatively expensive and that summers in Seville are extremely hot. So you’ll want air conditioning…or leave Seville for cooler weather in the hot summer months. But winter temperatures are mild enough that you’ll need fairly minimal heating. The waterside by the Guadalquivir River that runs through Seville. The first time I visited Seville, I was dazzled by the city’s vibrancy. Now, nearly two decades later, it still takes my breath away. This ancient metropolis is a heady mix of gorgeous Moorish architecture, trendy restaurants, and conviviality. Sevillanos take their social lives as seriously as Americans take their careers. Time for family and friends isn’t relegated to life’s margins, it’s a top priority every day with extra helpings on Sunday. Eating great food with people you love isn’t reserved for holidays but part of the fabric of daily life. “I could get used to this,” I told my husband the first time we visited. Rich and I were living in Cleveland at the time, and when the next bitterly cold, slushy February rolled around, we unanimously voted to leave the Snow Belt for another visit to Seville. We went back again and again, staying longer each time. Luckily we had a flexible schedule; Rich had taken early retirement, and as a journalist I could work anywhere. Finally, in 2004, we decided we’d move to Seville “for a year.” And we’re still there. I soon learned moving abroad is the best opportunity to reinvent yourself outside of the witness protection program! A Spanish friend persuaded me to join her art class, and for the first time in decades I began painting again. I started writing for a local expat publication, focusing on travel and culture, and am now the author of the blog Enjoy Living Abroad and five travel books, three of them Amazon bestsellers. I’ve mastered masses of technology, including social media, self-publishing, and video-making. It’s tremendously exhilarating. And I’m convinced it’s doing more to stimulate my brain’s synapses than Sudoku, bridge, or online games ever could. And then there’s the travel. Rich and I can walk out of our Seville apartment, stroll to the railway station, and step onto a train that will link us to the farthest reaches of Europe. Twice we’ve taken three-month railway adventures, visiting places I’ve dreamed of since childhood. One reason we can manage all this travel is because we live in an affordable city. I grew up in what’s now Silicon Valley, and one family member who’s still there pays six times our Seville rent for roughly equivalent lodgings. Meals in Silicon Valley easily run $50 per person plus wine at $10 to $15 a glass. In Seville, dinner at a trendy restaurant might cost $25 a person with wine, and in old-school eateries away from the center, lunch or dinner for two is often just $14. To some, my decision to live in Seville appears inexplicable or eccentric. But the reality is most expats move abroad for much the same reason we went away to college—not because we love our family or country any less, but because they have prepared us to go out and embrace a bigger, brighter future. Expat life is a splendid adventure. The French writer Émile Zola said, “If you ask me what I came into the world to do, I will tell you: I came to live out loud.” And if you ask me, I will tell you there’s nothing like moving to a city like Seville for pumping up the volume on your life.